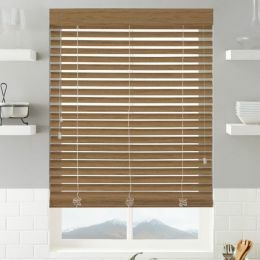 At Select Blinds Canada, faux wood blinds look just as good as real wood at a much lower cost. But the more budget-friendly price does not mean any sacrifice of quality. 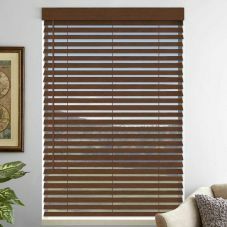 In fact, faux wood blinds are highly durable, as well as resistant to moisture and humidity, making them great for bathrooms, kitchens and any other high-humidity environments. Another benefit of faux wood is that these window coverings contain UV ratings up to 500 (whereas the average blind has a rating of 200). This means that the color of your faux wood slats will not fade or discolor when exposed to heat or sunlight. 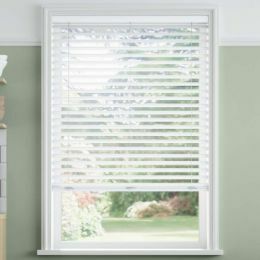 Faux wood blinds comes with 1”, 2” or 2 ½” slats, so there is always a size which fits your needs. 2” is by far the most popular slat size due to its appearance and suitability for most windows, regardless of the window sill depth or mount type. There are up to 30 color options from which to choose, depending on which faux wood product you purchase. This will allow you to match faux wood blinds with your home’s distinct décor and personality. 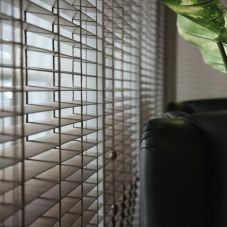 Horizontal blinds typically have ropes, called “ladders”, which are used to lift the blinds. Select Blinds Canada offers you two stylish ways to conceal the ladder. 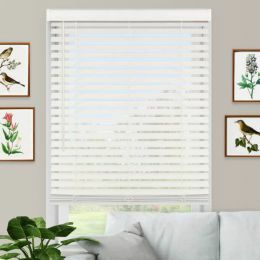 You can customize your faux wood blinds with decorative cloth tape, which gives the product a streamlined and stylish look. Create a unique window treatment for every window in your home by customizing sizes, colors and decorative cloth. The second option is the “no holes privacy” feature. This innovative feature conceals the ladders behind the slats, giving your faux wood blind a more finished and refined look, with no little holes in the slats. Multiple faux wood blinds can be added to a single headrail if you are installing faux wood treatments on a larger window. 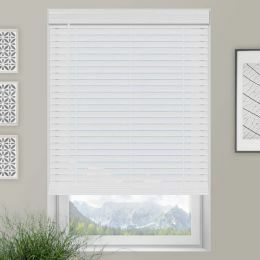 Depending on the size of your window, this allows for a clean look while making the blinds easier to install and operate.